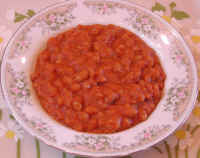 Clean and wash the navy beans and place in the slow cooker along with 10 cups of cold tap water. Set the slow cooker heat to "low". In the morning, wash and peel the onions and carrots, and wash the celery ribs. 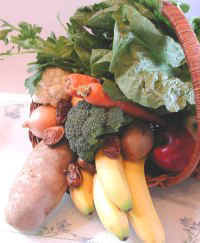 Cut the veggies into chunks, and place them in the container of a high speed blender (Vita-Mix type). Add the chipotle pepper, cover, and run the blender at high speed until the ingredients are smooth. 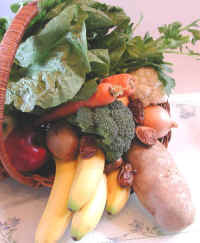 Stop the blender and add the contents to the slow cooker and mix well. Add the mustard and tomato paste, and mix again until the contents are thoroughly blended together. Cover the slow cooker and let the baked beans simmer for another 4-6 hours, or until you are ready to eat the baked beans later in the day. If cooking in a conventional oven at 350 degrees F., place the presoaked, rinsed, and drained navy beans in the baking pan or dish, add the onion, carrot, celery, and chipotle mixture, and the other ingredients, and mix well, cover and bake. 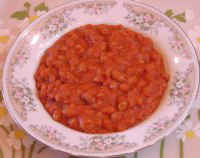 After 2 hours, mix the baked beans, add additional water if necessary, re-cover, and continue to cook until the baked beans are tender.